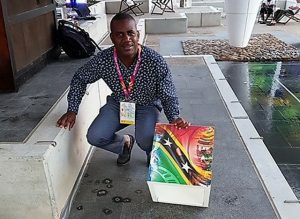 Gold Coast, Australia (5 April 2018) — 400metre athlete, Warren Hazel, is scheduled to arrive on the Gold Coast early Friday to complete the St. Kitts Nevis contingent at the XXI Commonwealth Games in the Gold Coast, Australia. “We’re not yet all assembled,” said Chef de Mission Lester Hanley but “The team has been in good spirits so far and we expect to see some good performances,” Hanley said. 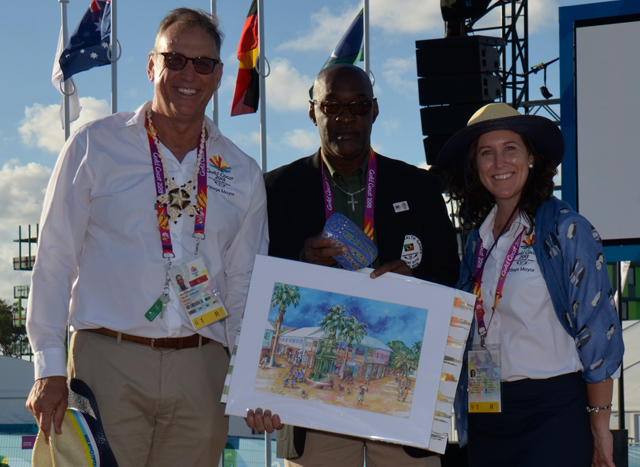 It was only two days ago that team St. Kitts Nevis was officially welcomed to The Games and the Athletes Village by Village Mayor Mark Stockwell. In a six-nation ceremony that also included Anguilla, Barbados, Brunei Darussalam, the Falkland Islands and Pakistan, our Federation’s flag was raised and the strings of “Our land of Beauty” filled the air of the open-air stage. This was followed by local dance entertainment and then a mixing and mingling of the teams. Last night the Games officially kicked off with the opening ceremony held at the Carrara Stadium where The Prince of Wales read the Queen’s message and declared the 21st Commonwealth Games, open. 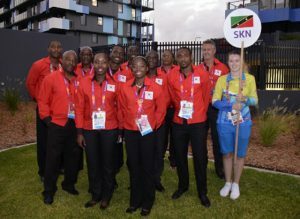 Team St. Kitts Nevis was lead by Flag Bearer St. Clair “Penny” Hodge who also represents one-half of our men’s beach volleyball pair. Hodge who is attending the Games for the first time was also appointed team captain as a mark of the inaugural entry of beach volleyball at the Commonwealth Games. 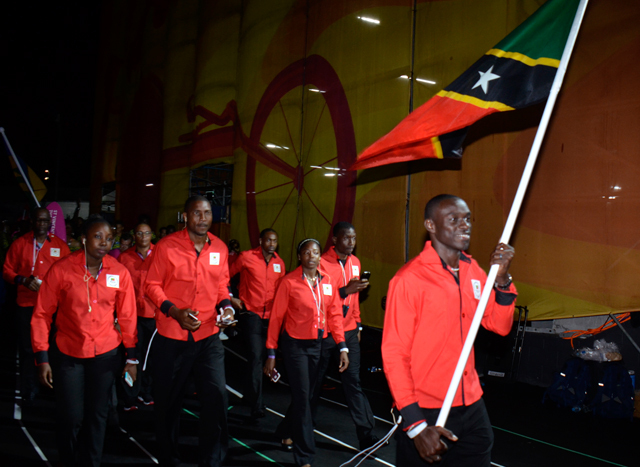 The volleyball pair will be first in action for St. Kitts Nevis when they take on Trinidad and Tobago in a straight Caribbean match-up on Saturday morning here in the Gold Coast, this would be at 8:30pm on Friday night St. Kitts Nevis time. Our track and field sprinters get on the go in the afternoon session on Sunday while the Table Tennis team will have to wait until Tuesday morning to paddle their rackets. Meanwhile Bermuda drew first blood, so to speak, when Flora Duffy won the women’s Triathlon event thereby claiming the first gold medal of the Games. Other gold medals to be awarded today include the sports of gymnastics, track cycling, swimming, and weightlifting. 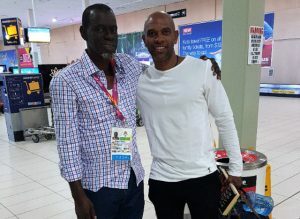 St. Kitts Nevis lone medal at the Games is in the men’s 100metres in Manchester 2002 when Kim Collins copped gold. 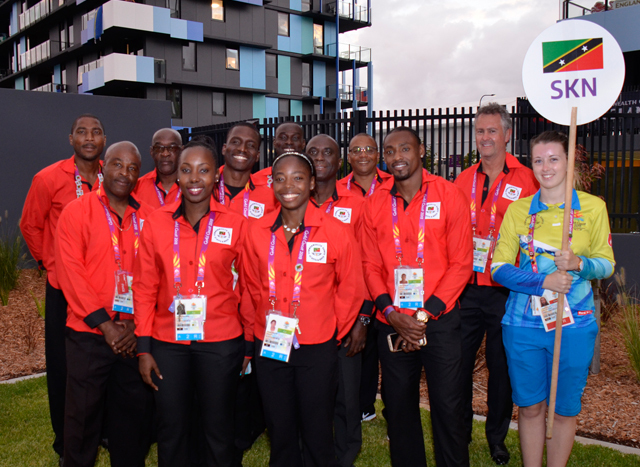 As far as medals are concerned St. Kitts Nevis is due. Perhaps that can change in the Gold Coast. We’ll just have to wait and see.